Hagia Sophia, the church dedicated to the Holy Wisdom which was rebuilt by Emperor Justinian in 537 is both the most imposing monument of the Byzantine Empire and a summary of its history. The use by historians of the term Byzantine Empire rather than Eastern Roman Empire indicates the abandonment of the Roman roots in favour of the Greek ones which occurred during the VIth century and eventually led Emperor Eraclius (610-41) to discontinue the use of Latin as the official language and to replace the title of Augustus with Basileus (monarch in Greek). The current building is the third church: because of its size it was usually referred to as Megalo Ecclesia (Great Church). According to some sources the first church was built by Emperor Constantine, but this is highly unlikely; he might have built a basilica, a civilian building, which his son Constantius II turned into a church. In 404 during riots the church was damaged by a fire. In 415 a new church was inaugurated by Emperor Theodosius II (408-50). The remains of that building show a mixture of traditional decorations, such as those of the ceiling, with new Christian motifs. This church was burnt down in 532 when opposite supporters of chariot racers (the Greens and the Blues) united against Emperor Justinian (527-65) and assaulted the imperial palace. 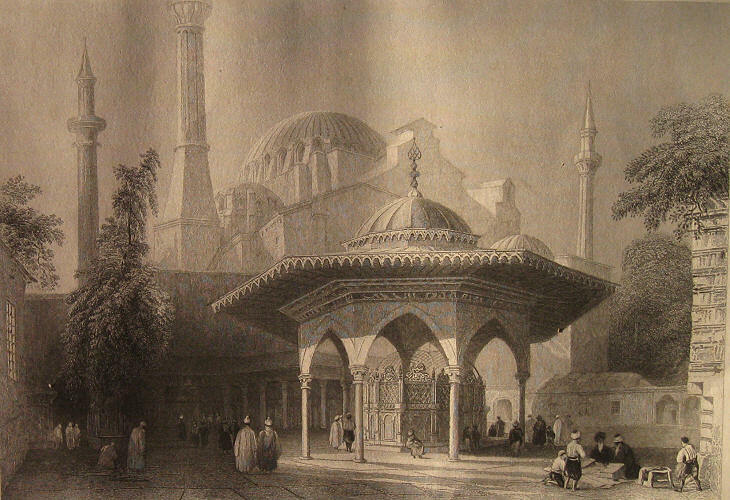 This led to a fire which destroyed a large part of the city including Hagia Sophia. Justinian survived the crisis associated with the 532 riots and profiting from a period of peace on the eastern border of the empire, started a campaign to conquer the province of Africa (today's Tunisia) which was then a kingdom of the Vandals. It was a successful initiative and in 534 Africa, Sardinia, Corsica and the Balearic Islands were annexed to the empire. In 535 the Byzantines attacked the Ostrogoths in Sicily and although their army was rather small they were able to move into the Italian peninsula and capture Rome in December 536. 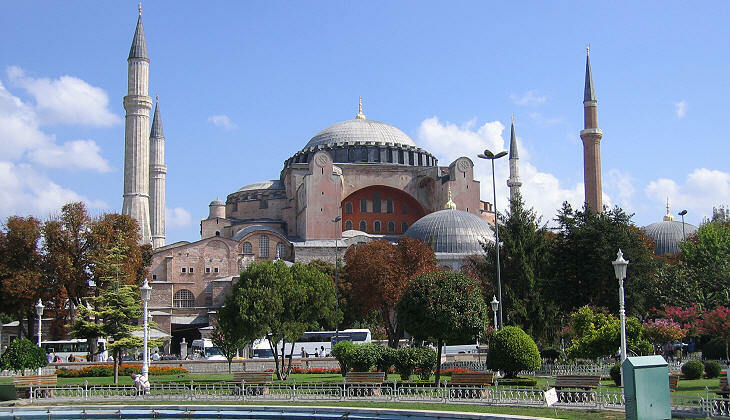 Justinian wanted to celebrate his triumphs by erecting a new Hagia Sophia, a building which would surpass in size and splendour those of Ancient Rome. 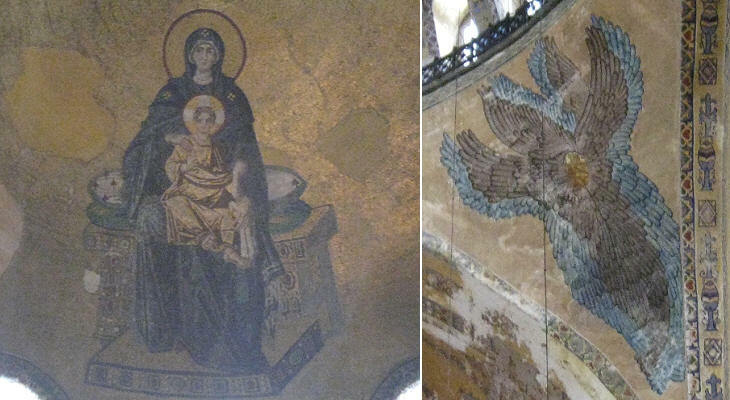 The dedication of the church to Hagia Sophia (Holy Wisdom of God - a rather awkward theological concept) was interpreted as a dedication to Mary the Theotokos (Mother of God), who was regarded as a representation of wisdom in the sense of saint humility, rather than knowledge. At the end of 537 the new church was completed, but the dome collapsed in 559 because of an earthquake. It was rebuilt in 563: its size was reduced and it was strengthened by buttresses. The inner diameter of its circular base is 31 m (102 ft), whereas that of the Pantheon is 43 m (142 ft). 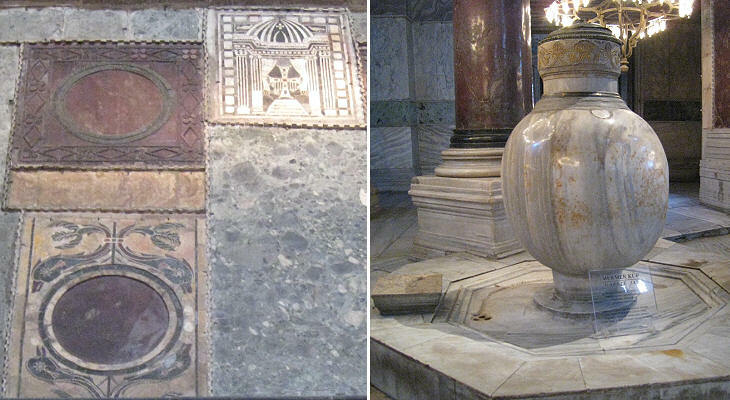 For the construction of Hagia Sophia Emperor Justinian did not spare resources and we know the church was decorated with precious marbles, in particular porphyry, the symbol of imperial power. The current decoration of Hagia Sophia retains only a small part of the original one; of the many additions which were made in the following centuries some are due to Ottoman sultans, such as two jars from Pergamum which were placed in the main nave by Sultan Murad III (1574-95). 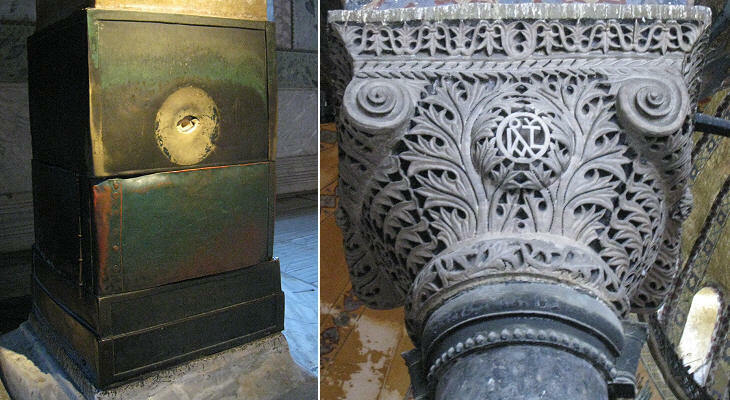 In S. Giovanni in Laterano in Rome there is a sweating stone and in Hagia Sophia there is a sweating column; while the former is associated with a dark prediction, the latter is thought to cure diseases of the eye and infertility. St. Gregory Thaumaturgus, a IIIrd century bishop, was a worker of wonders. With the exception of Agrippina the wives of the Roman emperors did not play a major role in state affairs, while those of the Byzantine emperors often did. 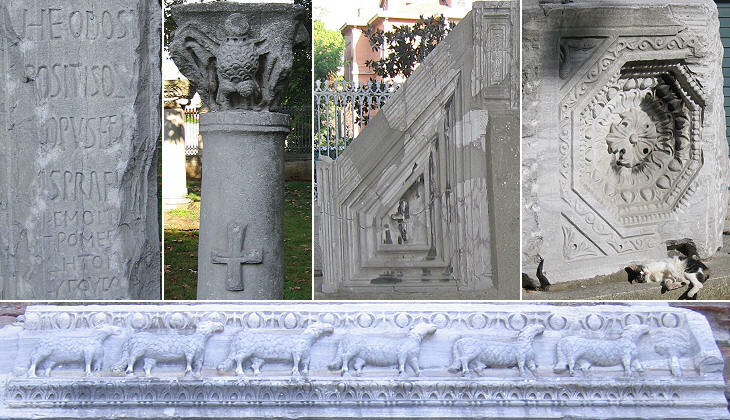 Theodora, Justinian's second wife and a former actress, almost shared the throne with her husband; the fine capitals of the columns of Hagia Sophia show the composite monogram of the couple (I and T). 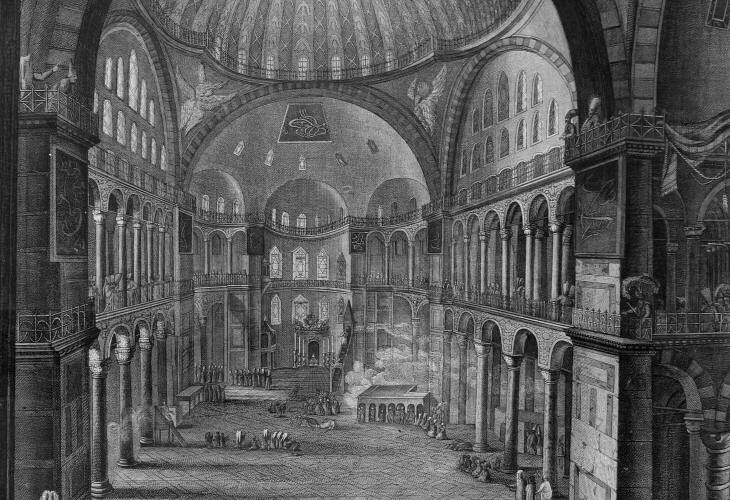 Hagia Sophia had separate sections for men and women: it is thought that the upper gallery was reserved to the empress and her court: it retains some well preserved mosaics with a decorative motif (acanthus leaves) which was used also in the mosaics of S. Maria Maggiore in Rome. During the Late Roman Empire the art of mosaic reached its peak (see the mosaics found at Antioch) and mosaics continued to play a major role in the arts of the Byzantine period. Sculpture was completely abandoned: it was too strictly associated with the ancient gods and with a way of life which was regarded as sinful. 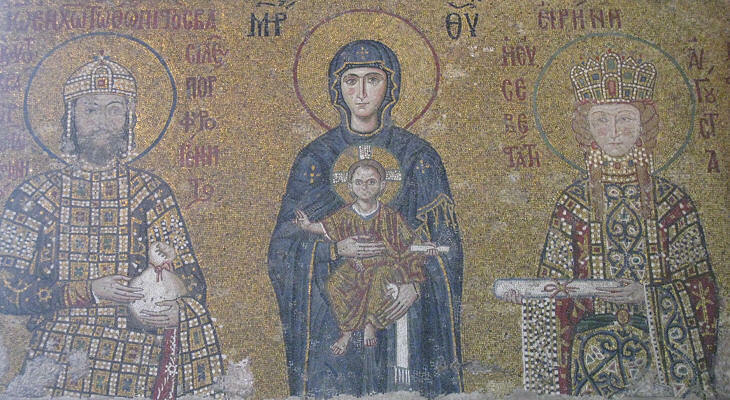 All the mosaics of the time of Emperor Justinian which portrayed sacred images (and in general human beings) were removed during two iconoclastic periods in the VIIIth and IXth centuries. Iconoclasm (breaking of images) was probably influenced by contacts with the Muslim world. The orders issued by the Byzantine emperors to destroy all the images were not carried out in the Italian Byzantine possessions, so that to see the splendour of Justinian's court one has to visit Ravenna; Rome too retains some very old mosaics. 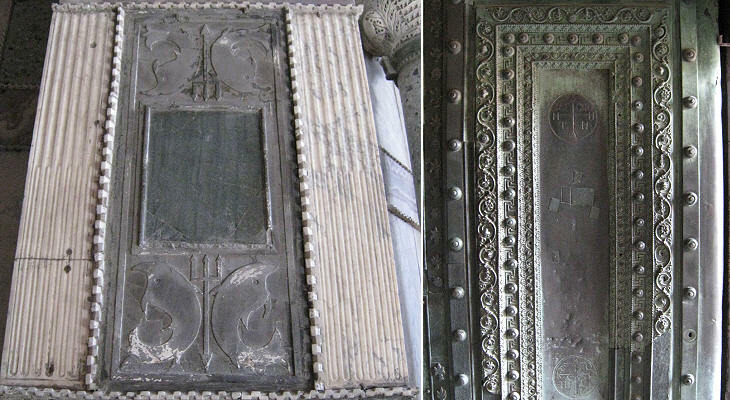 Even in those obscure periods Hagia Sophia continued to be embellished: the bronze door shown above is thought to have been added in 838 by Theophilus, the last iconoclastic emperor (829-42). It was another Theodora, the wife of Emperor Teophilus, who restored the veneration of the sacred images in 843 when, after the death of her husband, she was regent for her son Michael III (843-67). 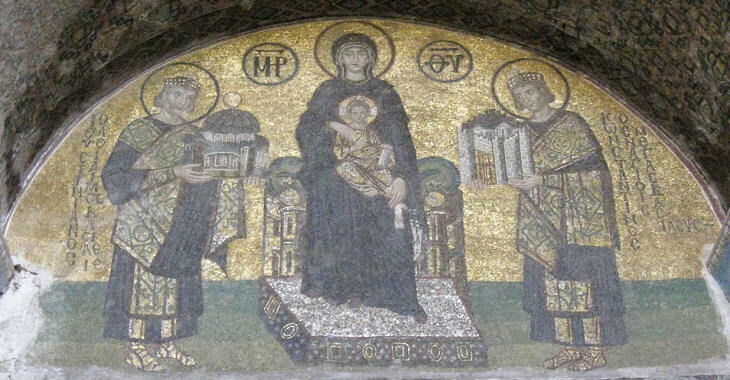 In 867 the first post-iconoclasm mosaic was completed in the apse of Hagia Sophia; it is thought to be a reconstruction of the original one: it portrays Mary the Theotokos. The Byzantine image of the emperor was an iconic one that is a symbol of power and not the actual portrait of the man, as in the case of the ancient Roman emperors. 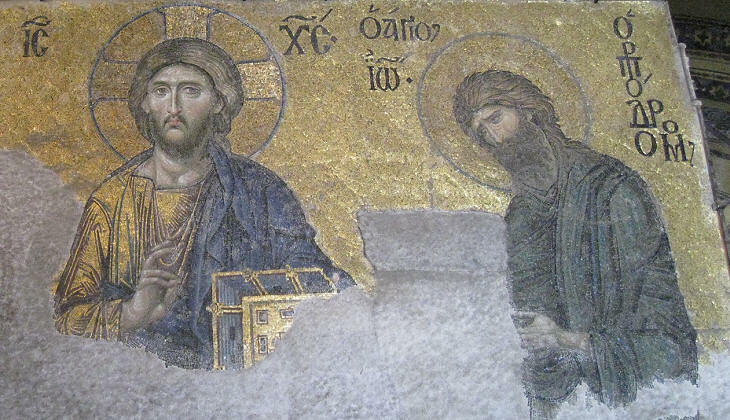 For this reason there is uncertainty whether the emperor portrayed in the mosaic above is Leo VI or his son Constantine VII Porphyrogenitus (912-59). The latter had this attribute which means "born in the porphyry" to stress he was the legitimate son of Leo VI. Religious rules vary over time: in the Xth century according to the Patriarch of Constantinople it was not appropriate for an emperor to marry again after having been widowed twice. Leo VI at the age of 33 was already in that situation and childless; he disregarded the advice of the Patriarch and he married a third time but the bride died a few months later. The emperor then decided to have a mistress, but when she gave birth to a child, he appointed a new Patriarch and he married his mistress. In order to strengthen his son's right to the throne he had arranged the delivery to take place in a special room of the imperial palace, which was decorated with porphyry and where the empresses gave birth to their children. 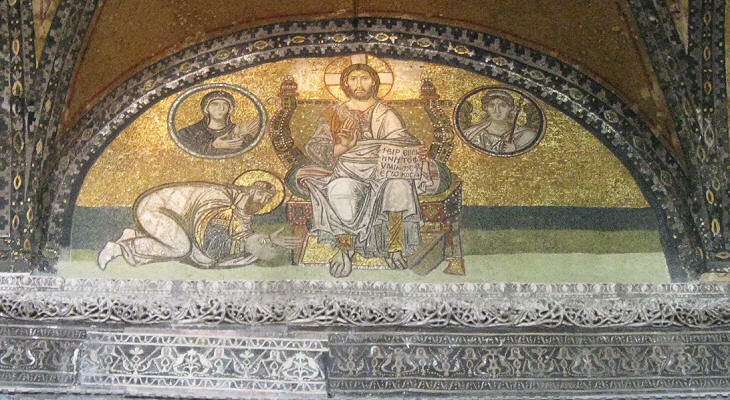 In the mosaic which is placed above the main entrance to the central nave the emperor is portrayed in a very humble position, but on the same scale as Christ and with a halo: the text on the book reads: Peace be with you. I am the light of the world. The Byzantine court was a dangerous place and emperors were suspicious of everyone and in particular of their relatives. Emperor Constantine VIII (1025-28) was wary of his potential sons-in-law and for this reason he did not allow his three daughters to marry. Only on his deathbed he married his daughter Zoe to his chosen heir Romanos III. Three days later he passed away and Romanos and Zoe succeeded to the throne. She was 50 and her husband paid little attention to her. They were portrayed in a beautiful mosaic in the upper gallery of Hagia Sophia: Zoe looks very humble and very small, but she had an iron will and she resented the behaviour of her husband. A few years later Romanos was found dead in his bath and soon after Zoe married her chamberlain who was 24 and who became Emperor Michael IV; his portrait replaced that of Romanos in the mosaic. Zoe outlived her second husband and she became the co-ruler of his adoptive nephew Michael V. The new emperor tried to banish Zoe, but the people of Constantinople revolted and Michael was arrested, blinded and sent to a monastery where he died soon after. Zoe became the sole ruler of the empire and she remarried a third time: the portrait of Constantine IX Monomachos (the one who fights alone) replaced that of Michael IV. A very similar mosaic portrays a happy couple; the marriage between young John Comnenus and the Hungarian Princess Piroska, daughter of King Ladislaus of Hungary, was arranged in order to improve relations between the two countries. It proved a happy marriage: the couple had eight children. In this mosaic the portraits seem more true to life than in the preceding one; the empress has a fair complexion and long blond hair in plaits; the emperor, who was nicknamed the Moor, has a dark complexion. In the centre of the mosaic the portrait of Mary is a rather conventional work. John Comnenus presided over the restoration of the Byzantine Empire: he recovered part of the territories conquered by Turkish tribes, including Kastamonu, his family's hometown. During the long reign (1143-80) of Manuel I Comnenos the Byzantine Empire regained some of its old possessions and the emperor even made an attempt to re-conquer Egypt, but the expansionist policies he followed led to several setbacks. He tried (in vain) to conquer Konya, his attempts to restore Byzantine rule on parts of southern Italy failed and he broke relations with Venice by confiscating its properties in Constantinople. In 1204 the Most Serene Republic took its revenge by masterminding the intervention of the Crusaders in a dynastic quarrel: subsequently the Venetians supported the conquest of Constantinople and the fall of the Byzantine Empire. A marker in Hagia Sophia indicates the tomb of Henry Dandolo, the Venetian Doge who led the expedition. 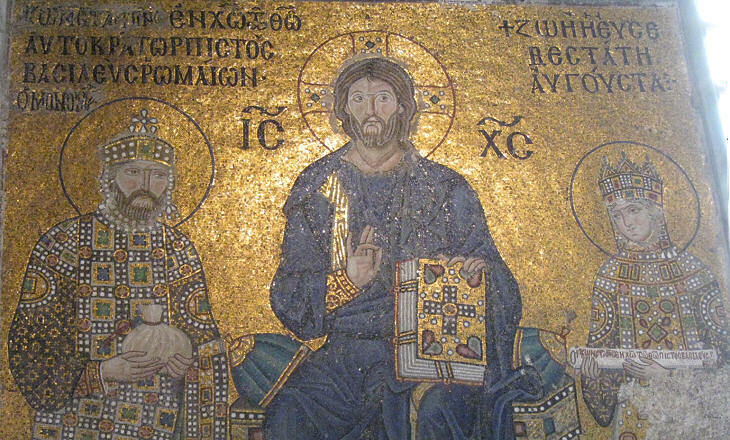 The Byzantine Empire was restored in 1261, but it never regained its former importance: a beautiful mosaic in Hagia Sophia is thought to have been commissioned to celebrate the event: the humane expressions indicate the influence of Italian art. 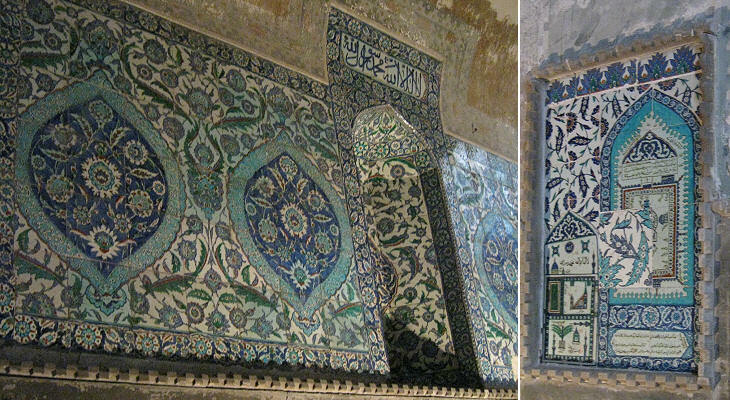 After the 1453 Ottoman conquest of Constantinople, Hagia Sophia was turned into a mosque; it is known that for a long time the mosaics were not erased or covered. In the interior additions were minor and also tile decoration was limited to small sections of the upper gallery. More attention was paid to the exterior with the addition of four minarets and to the structure of the building which was strengthened by additional buttresses. While the Byzantine emperors had moved their ordinary residence to the remote Blachernae Palace, the Sultans built their palace (Topkapi Sarayi) next to Hagia Sophia on the site of the ancient acropolis of Byzantium. 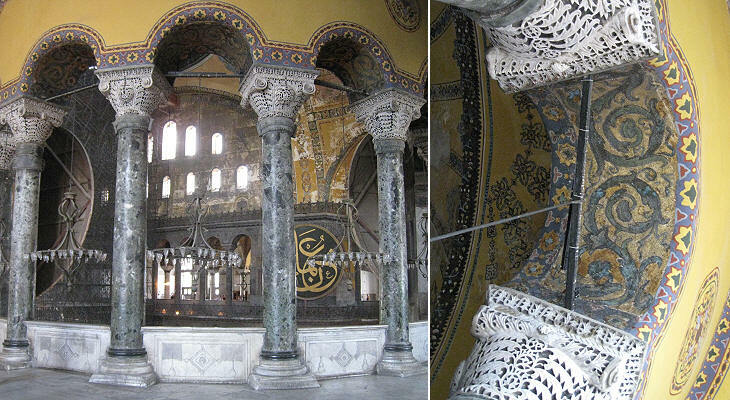 In 1935 Hagia Sophia was turned into a museum and the plaster covering the mosaics was removed.